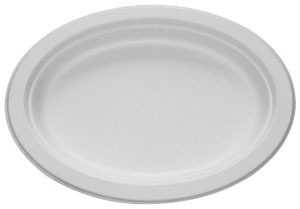 These larger, disposable dinner platters are the essential party plate. The smooth texture and ivory color make a great presentation on any table. They are made from a natural by-product called Bagasse and are fully biodegradable and compostable. Your guests will be impressed with the sturdy design and your decision to go green.